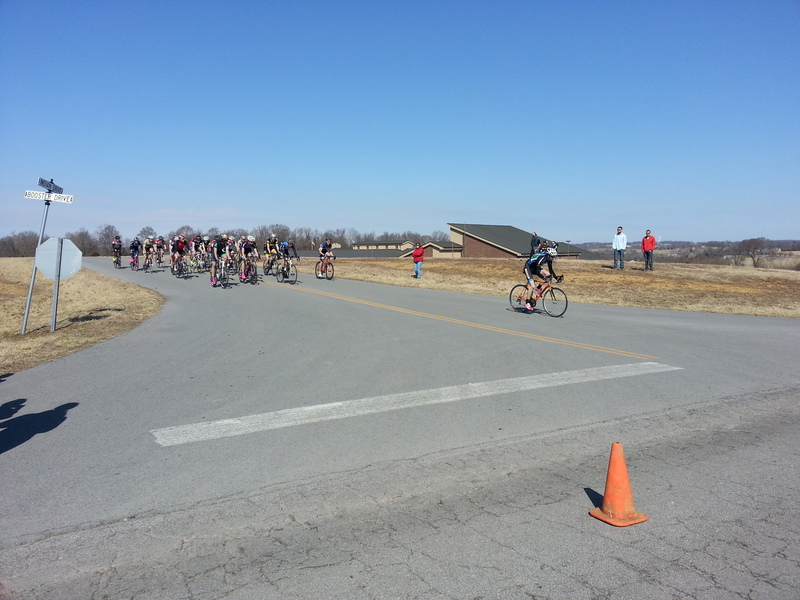 COLUMBIA, KY- The Student Cycling Coalition competed in its first ever road race in Columbia, KY hosted by the Lindsey Wilson College Cycling Team. Evan Kuhl, Andrew Tursic, and Erik Seibt wait for the whistle before the TTT hosted by Lindsey Wilson College on Feb. 22. The race weekend began at 8 a.m. CST on Saturday February 22 at Kellyville Church with a cold and relatively hilly 12 km Team Time Trial. When asked about the course, third year medical student Evan Kuhl said, “The hardest part is going to be staying together on the hills.” At 8:06 the Louisville Men’s D team composed of Andrew Tursic, Erik Seibt, and Kuhl set off on its race against the clock. Tursic towed the team safely up to the turn around point and broke off the train leaving Seibt and Kuhl to finish out the last 6km on their own. After crossing the finish line, Kuhl said, “It felt good– good course, good effort; can’t complain.” The SCC finished the Men’s D TTT event in second place with a time of 18:32 min. The Indiana University Men’s D squad won the Men’s D TTT by posting a time of 16:34 that stood unbeaten until Marian University’s 3rd Men’s A squad took the course. 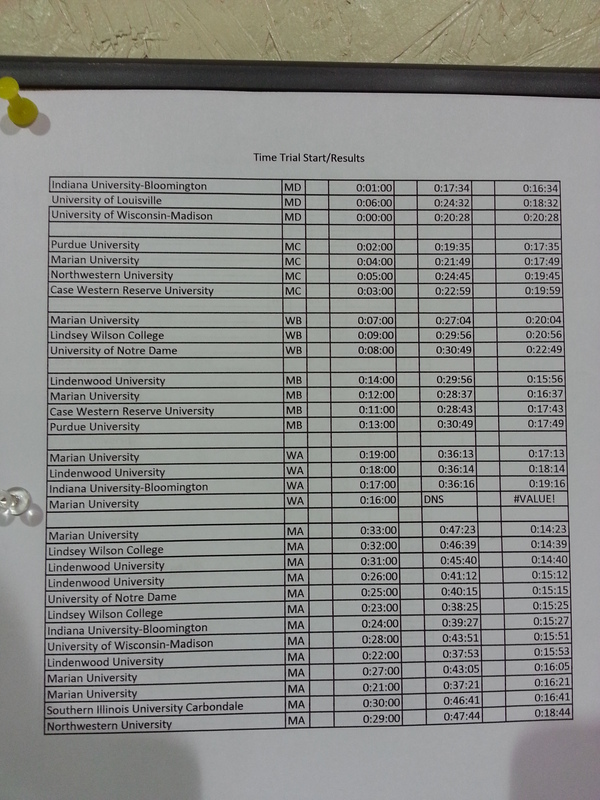 Results from the TTT hosted by Lindsey Wilson College on Feb. 22. 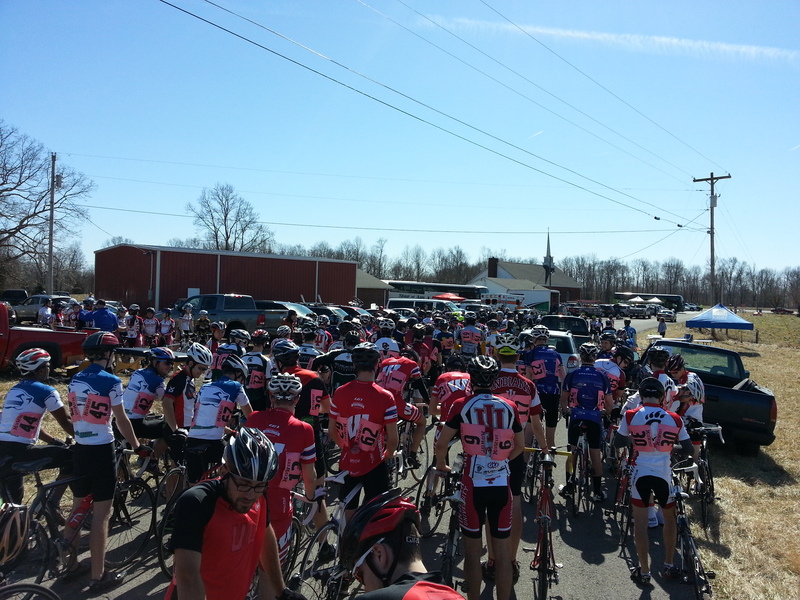 Later in the day, as the weather had warmed to 60 degrees, the team started the 25 mile road race in Purdy Church. Before the race, Tursic said “We’re going to have to play it smart,” while Kuhl added that the emphasis would be on “Good teamwork, and good communication.” The packed Men’s D field of 71 riders was set to roll at 1:15 CST through a winding 25 mile course that featured 3 short uncategorized climbs; with the final climb a mile away from the finish line. Lining up for the Cardinals was a team of five: the three riders from the TTT plus the addition of Joseph Wheatley and Josh Goodman. Early in the race, Tursic was caught in a crash that involved several riders but chased back to the main group. Riding together, Kuhl, Seibt, and Wheatley led the chase of the break away but were unable to reel it in before the final climb. Wheatley finished 22nd, Seibt 24th, Kuhl 35th, Tursic 53rd, and Goodman 54th. Chris Besaw of the University of Wisconsin-Madison won the D race, with the University of Kentucky and Indiana University placing 2nd and 3rd respectively. The Men’s D field lines up at the Road Race hosted by Lindsey Wilson College on Feb. 22. 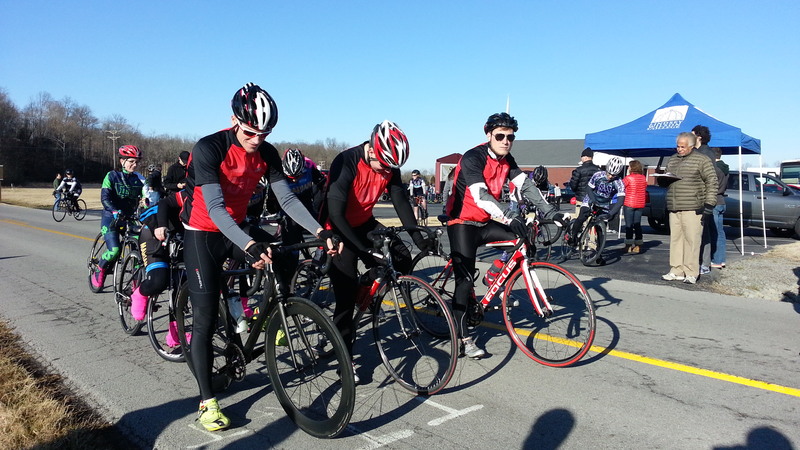 On Sunday February 23, the team participated in the criterium held at Adair County High School. The course was a fast 1/3 mile four corner circuit that featured a short steep climb on corner 3. Owen Stone represented the Cardinals very well in the Men’s B race, reeling in several breaks before Kenny Hall (Lindsey Wilson) was able to get away for a solo win. “I tried to stay near the front and watch for breakaways” Stone said. He rode to a 7th place finish in the bunch sprint following Hall’s impressive solo win. The main group of the Men’s B criterium hosted by Lindsey Wilson College on Feb. 22. chases an early break away after cresting the hill. The Men’s D criterium team featuring Abner Miralda, Andrew Tursic, and Josh Goodman didn’t fare well in the criterium. They worked well as a team, and took turns fighting the strong headwinds, but eventually were caught by the leader’s breakaway that chewed up the field of 70 down to less than 20. Michigan Cycling tweeted about their top D rider, “Doug Plowman grits out a top 10 finish in the D race that got splintered early and never slowed down.” Despite the setback of the Men’s D criterium, the team was happy with its overall effort in its first ever collegiate road race weekend. “We’re excited for this new season,” said Tursic.